“What Child Is This?” from Christian Faith Publishing author Ann Lapp-Haught is a detailed account of her personal life story that narrates her dark past as a child who was abused by her stepfather until she was able to get away by the age of sixteen, her failed relationships and marriages, and her breaking point that turned her to Jesus Christ. “What Child Is This?”: a compelling work on overcoming life’s challenges and a recounting of how God is working in one’s life all along. “What Child Is This?” is the creation of published author, Ann Lapp-Haught, a passionate Christian whose acceptance of Jesus Christ has changed her life. Published by Christian Faith Publishing, Ann Lapp-Haught’s new book is a fascinating account of how the Lord is ever-present in her life as she deals with the twists and turns of her journey as an abused child and the opportunities he has given her to use her musical and theatrical talents for his kingdom. Lapp-Haught writes the periods in her life in a descriptive and transparent style. She has also provided various photographs to support the timeline of her narrative. View a synopsis of “What Child Is This?” on YouTube. 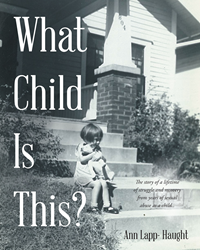 Consumers can purchase “What Child Is This?” at traditional brick & mortar bookstores, or online at Amazon.com, Apple iTunes store, or Barnes and Noble. For additional information or inquiries about “What Child Is This?”, contact the Christian Faith Publishing media department at 866-554-0919.